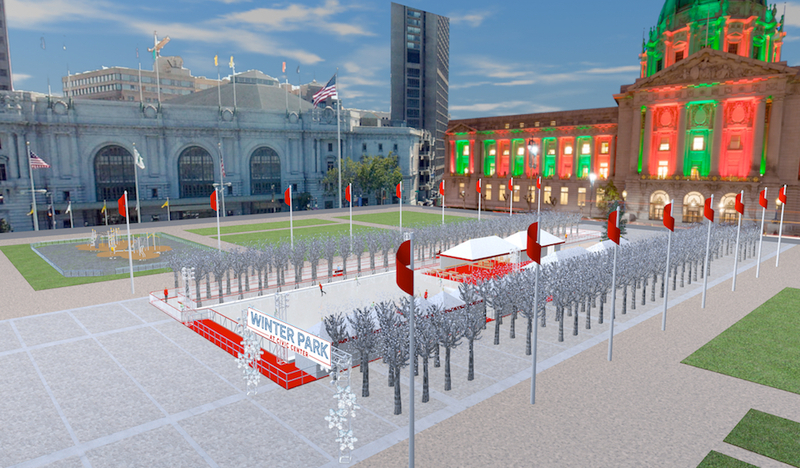 This holiday season, San Francisco's Civic Center will be decked out with a brand-new ice-skating rink and other curated seasonal events. Winter Park at Civic Center will include a 100-by-60-foot ice rink, as well as a 400-square-foot ice skating track weaving through Civic Center Plaza's pollarded trees. It will open on Friday, November 30, with a special ceremony featuring local politicians and dignitaries and performances on the ice. 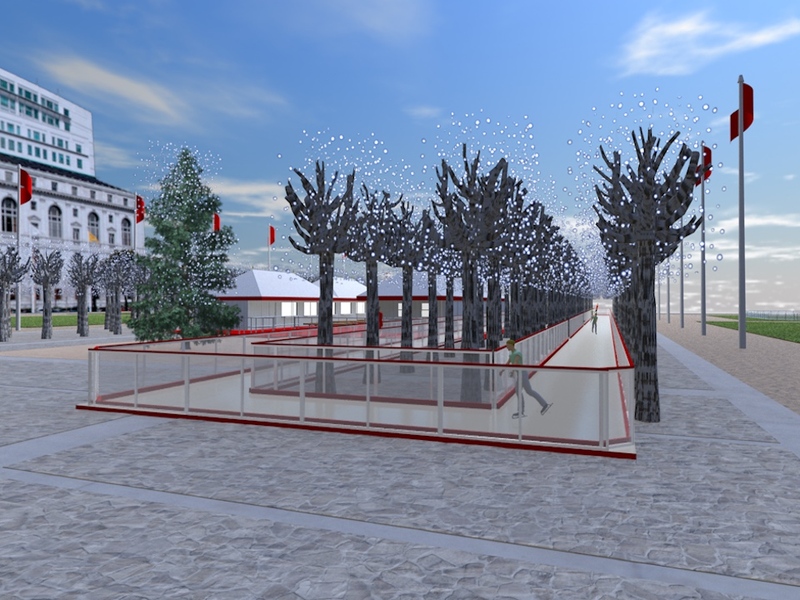 Winter Park will host events, as well as offer areas for non-skaters to participate and watch. The rink will be operated by Willy Bietak Productions, the same company behind the annual holiday ice rink in Union Square. According to a press release, the company will host an array of curated skating events similar to the ones it puts on in Union Square, such as themed skate/dance parties, family-friendly "drag queens on ice" performances, and donation drives. The city will also host curling lessons every Sunday morning in December, for up to 30 participants each day. iHeart Radio will sponsor dance party DJ nights each Wednesday evening. 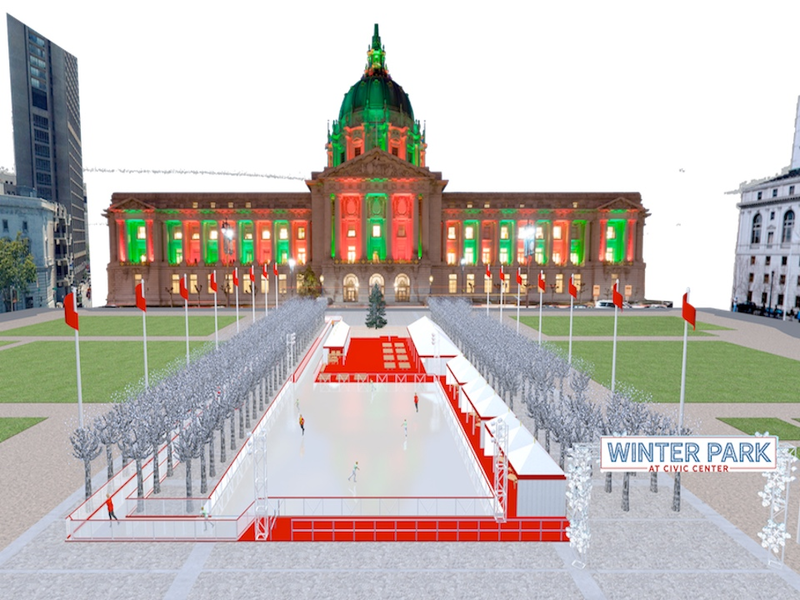 Winter Park at Civic Center will include an ice track through lighted trees. Tickets for the ice rink will go on sale on Monday, October 15. The price is $20 for adults and $15 for children under eight years old, and includes a skate rental. The city and Willy Bietak Productions are working with some local agencies, including the Tenderloin Community Benefit Program, to try to make the ice rink accessible for everyone in the neighborhood. Any child attending kindergarten through 12th grade in the Tenderloin will get a chance to experience Winter Park free of charge, according to Regina Merill, spokesperson for public relations firmCharles Zukow Associates. There are also plans to work with neighborhood organizations, including St. Anthony's and GLIDE, to host programs programs to benefit homeless and low-income neighbors. Winter Park will be nestled in Civic Center Plaza, near the recently renovated Helen Diller Playgrounds. The new ice rink is part of an ongoing effort to bring new life to Civic Center Plaza through the Civic Center Commons initiative. The initiative has worked to add public art to the area, and also hosts regular programming such as Thursday-night block parties and community events each first Sunday of the month. Tickets for Winter Park at Civic Center can be purchased starting next week, either online or at the ice rink ticket window that will be located at 355 McAllister St. The ice rink will be open daily from noon to 10 p.m. from November 30 through January 6.